When you're organizing people and events, you need a reliable source for compelling graphics and signage. InstantSign can work with you to create directional signage, special events banners and trade show exhibits. We can help you promote your group or association by reproducing your logos and graphics, as well as those of all your contributors and co-sponsors, precisely and professionally. Use big, bold custom banners to generate excitement special events. Big, bold banners draw attention from a distance, promoting your events and awareness in a powerful and cost-effective way. InstantSign is a freestanding, vertical-banner display that lets your organization promote products, programs, fundraising and special events virtually anywhere. Dramatic impact in a portable, easy-to-use display. Identify your official vehicles with permanent vinyl graphics or convenient, removable magnetic signs. An attractive, well-organized menu board promotes sales of food, beverages, and memorabilia - and keeps the line short by helping patrons make their choices before they get to the front. Meeting OSHA signage requirements helps protect both employees and customers and members throughout your facility. Bold, legible window lettering puts your, services provided, and other essential information in clear view. InstantSign can design and coordinate your complete trade show exhibit system, including full-color graphics and convenient, shippable carrying cases. High visibility displays expand to meet your exhibit needs. InstantSign is your expert on signage required by the Americans with Disabilities Act. Let us help you bring your site into full compliance! ADA compliant directional signs and graphics. Let InstantSign coordinate all of your event signage. We know exactly what it takes to put together a comprehensive signage package for your event. InstantSign will make your job easier and your event more successful. Make a great impression with a well-designed sign. The design professionals at InstantSign can make your sign easier-to-read and remember through the use of borders, color and eye-catching graphics. 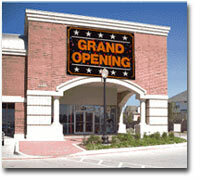 Use full color digital graphics on your signs. Vibrant, dimensional full color digital graphics and photos make your signs more powerful and your message more memorable.